Kong stuffing as art form? 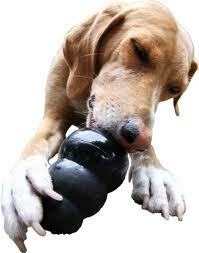 Kongs now come in a wide assortment of colours and shapes. For stuffing purpose, the classic Kong shape tends to work best. The different colours aren’t just a gimmick, they let you know how hard or soft the Kong is. Puppies and seniors generally need softer Kongs for tender teeth and gums, the red Kong will usually satisfy the needs of most mild chewers while highly active dogs, strong jawed large breeds and destructive chewers probably need the Extreme Kong (black). Also be sure to get the right size. The smallest size might seem right for your tiny dog, but can be hard to un-stuff due to the tiny opening. A giant Kong might look right for your big breed but if you’re stuffing it full of food you might want to go down a size or two. Are you still just putting a blob of peanut butter in your dogs’ Kong? That might work but we can do better with minimal extra effort. Try one of Rover’s favourite little treats at the bottom. Top it up with some of his daily rations (kibble held back from daily meals). Layer in another tasty treat in the middle and one at the top. Feel free to pack in some carrot or apple cut into small pieces for low-cal fillers. Plug it with a teaspoonful of something spreadable. Peanut butter is one option but you can also use wet dog food, cream cheese, mashed banana or sweet potato or even plain greek yogurt. Just make sure it’s something free of added sugar or preservatives and that it’s something Rover truly loves and digests well. If I pack a Kong too tightly my Kali will give a snort of disapproval and walk away. My parents’ old dog Molly would spend an entire day patiently and diligently working at the same puzzle. If your dog is more like Kali, you want to pack it loosely and plug it gently. If you’ve got a Molly, pack it tighter and pop it in the freezer for the added challenge of working through the frozen plug (this is also useful for teething pups). There is no law that says that dogs must receive their meals in a dish on the floor. Stuff meals into Kongs for added stimulation. This is also a great trick if you’re trying to slow down your dog’s hoovering habits or if you need to occupy your dog while you prepare or eat your own dinner. It’s also a great way to provide extra stimulation without a lot of extra food. When stuffed right, your Kong becomes a valuable tool for creating wonderful associations with otherwise less desirable events such as crating, being left alone or hanging out on his bed while company is visiting. 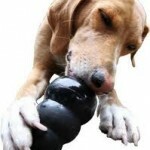 Dogs love novelty – having the Kong appear only at these times instead of leaving it lying around all day will keep it more valuable. And if your dog has reached the age of trustworthiness in your home, try my favourite game: just before leaving the house, stuff a couple of Kongs and, along with a few individual little treats, hide them around the house (or the room that Rover is allowed to be in). Only allow him to go for it when you’re ready to leave (you may need to stay the first couple of times to show him what you’ve done for him!) This little scavenger hunt taps into Rovers’ inner dogginess and will have him ushering you out the door faster to get to the fun that awaits! Make Kong stuffing a part of your daily feeding routine. Using daily rations, prepare a couple at night before you go to bed or in the morning when you prepare Rovers’ breakfast. It takes only 2 minutes and the payoff is huge. Happy stuffing! If you’ve got some other creative uses for Kongs or ways to stuff them we’d love to hear them!